Type and Characteristics - Sidewheel steam frigate, built by Philadelphia Navy Yard, laid down 1839, commissioned 22 December 1841, launched several weeks later in 1942, 3,220 long tons, 229ft long x 40ft beam x 19ft draft, armed in 1841 with 2-10in and 8-8in Paixhans shell guns, first commanded by Capt W D Salter. Log Period and Areas of Service - 1852-55, Perry's Expedition to Japan. 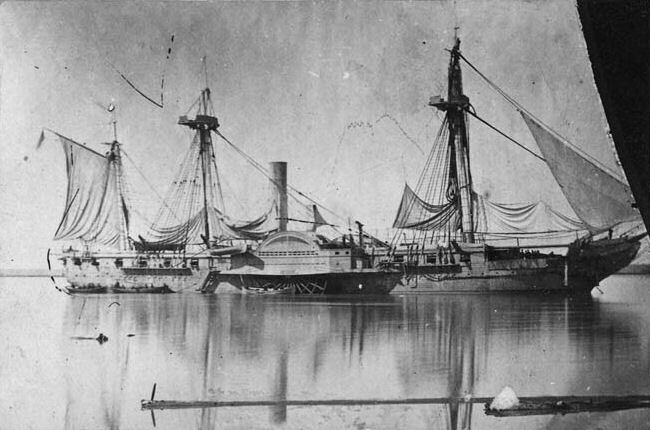 1849-51 - Served in Mediterranean, then returned to USA to prepare as flagship for Cdre Perry's expedition to Japan. 24 November 1852 - Squadron departed Hampton Roads for Far East, via Madeira and Cape of Good Hope. 4 May 1853 - Arrived Shanghai, via Hong Kong. 8 July 1853 - Squadron made its first entry into Tokyo Bay after calling in at the Ryukyu and Bonin island groups. 1853 - After leaving Japan, cruised in the Far East. 12 February 1854 - Squadron returned to Tokyo Bay for second visit. 31 March 1854 - American-Japanese treaty, the Treaty of Kanagawa was signed. 23 April 1855 - Returned to New York. 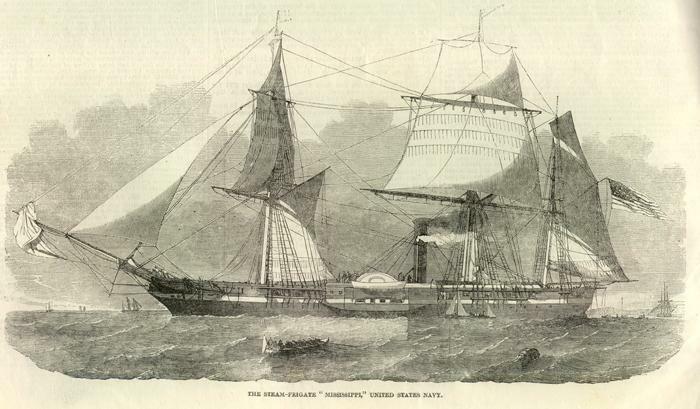 Fate: Sailing to attack Port Hudson, Louisiana during the Civil War, ran aground on 14 March 1863. Stranded, she was fired and the flames reached the magazine, destroying her.